Based o n the results of our annual survey we learned that our members want more networking! 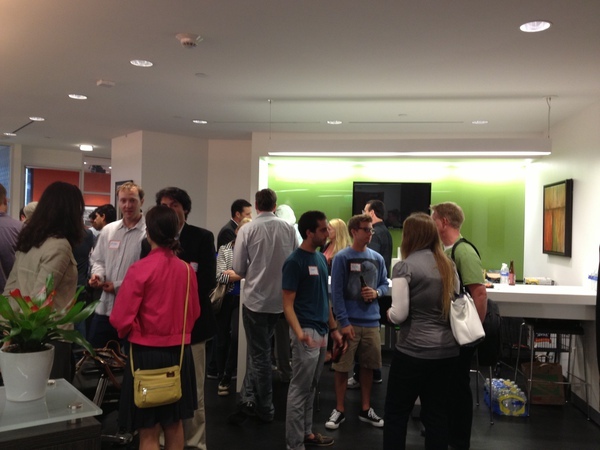 So we had our first SMhub networking event yesterday at Regus. There were more than 100 people attending. 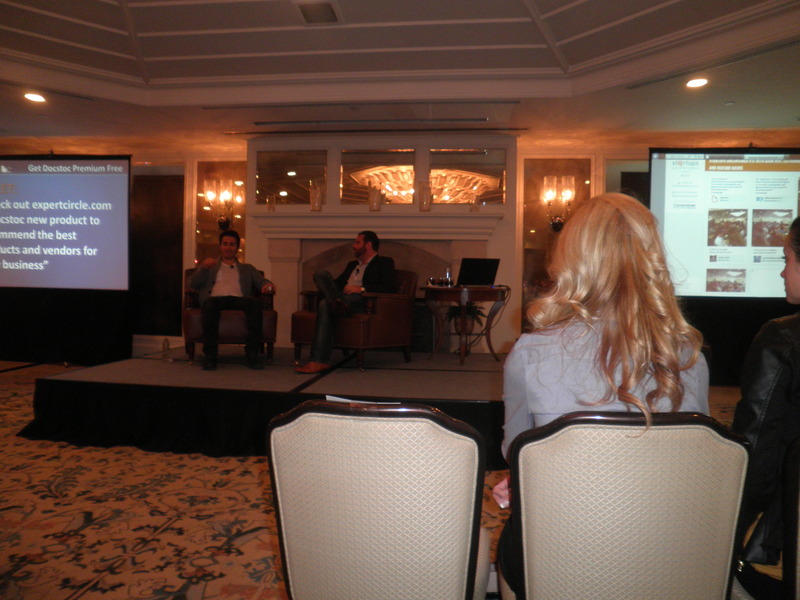 Josh Ochs from MediaLeaders gave great Marketing tips for startups, TiempoDevelopment bought us all beer an d snacks. After Jennifer Carter, CEO of Regus, told us about her office space and upcoming event, all attendees split into 3 main networking sessions: Social Media, eCommerce+Mobile and Healthcare. 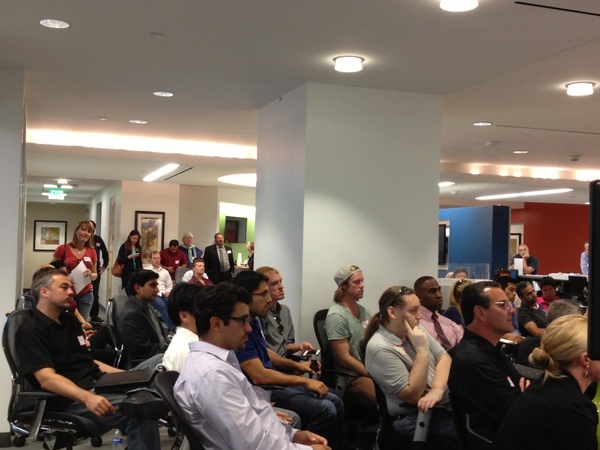 We will have our next networking event on July 15, while we still run our once a month pitch/demo events. Like it or not, money is the lifeblood of a business. If you are on the hunt for capital and have landed a meeting with an investor, your first impression can either be a deal breaker or money in the bank. According to Founder Institute, an early-stage startup accelerator in Mountain View, Calif., one of the biggest flubs rookies make in an investor presentation pitch is failing to include charts and graphs. If you aren’t sure how to go about making charts and graphs that relate to your financial projections, you can consider hiring a business student or a certified public accountant for a day to help. Also, the institute says, steer clear of promising potential investors that your startup is going to be worth $1 billion by its fifth year. Investors want conservative estimates that they can trust, not pie-in-the-sky guesstimates. Avoid a “hard coded” financial spreadsheet in your presentation – that is, don’t make your numbers unchangeable in a spreadsheet. Present your information so that investors can play with your various financial inputs to see how your business model will survive in changing conditions. Skip what’s known as a “top down” financial forecast where you assume that your company will automatically win a percentage of some existing market. Instead, use what’s called “bottom up” forecasting, where you base your financial projections on an actual budget: essentially, how many items you are going to sell multiplied by how much each is worth. Talk about the size of your total addressable market (TAM), but don’t focus on it. For example, if you are creating an iPhone game for women ages 35 and up, the size of the entire gaming industry would be your total addressable market and would be largely irrelevant. Instead, research your serviceable addressable market (SAM), which in this example would be the total market for women over the age of 35. In the infographic, Founder Institute offers a list of the 10 rookie pitching mistakes it sees on a regular basis. Based in Los Angeles, California, TechZulu is an independent news organization delivering an insightful story of the technology industry by showcasing the very people creating it. Our mission is simple: to discover, cover and connect you with vetted technology resources in the Southern California ecosystem and beyond. A pioneer in live Web television, TechZulu engages millions of viewers through real time reporting at conferences and its weekly news show, TechZulu Live. TechZulu also offers production services for conferences and events, and runs the Spotlight Series highlighting promising new technologies. Final Friday http://bit.ly/18uWhxE. Another great event Fireside chat with AngelList and VentureHacks co-founder Babak Nivi was hosted by Jason Nazar, the Co-Founder and CEO of Docstoc.com, on Wednesday, May 22, 2013 at 6:30pm at Shutters on the Beach Hotel, 1 Pico Blvd Santa Monica, CA 90401. Docstoc has the “widest selection of professional documents (over 20 million), and resources including articles, videos, & productivity tools to make every small business better. Docstoc is a top 500 most visited website worldwide and has over 28 million registered users. It offers a vast collection of free resources & provides a monthly membership which unlocks its widest selection of premium content. Latest Docstoc product, ExpertCircle, is a recommendation engine for the best products & vendors for you business”. This event is #37 in the series of events dubbed as Startups Uncensored. This month’s guest of the fireside chat was Babak Nivi, who is the co-founder and President of AngelList and Venture Hacks, Good advice for startups. He has worked at VC firms including Bessemer and worked with startups that are backed by Sequoia and Benchmark. He has 2 patents and is a graduate of MIT. The interview was very refreshing as Babak has a great sense of humor. He said that the best decisions he made when he was 25 were to drop out of PhD program and move to San Francisco. His company has 13 employees and was funded by Kauffman foundation. His company aspires to become Craigslist for startups, talent, incubators, and become wildly profitable. He said that he thinks that every startup’s mission should be to change the world. During Q&A session, he said that there is no need to join the incubator if you know what you are doing. Usually to get investors you need either traction, pedigrees or demo that would vow everyone. For MVP you don’t’ need to spend a lot of money, just a Wufoo form and a blog post would do it. I met several local startup founders at this event, like Kuyam, CampusExplorer and other ones. 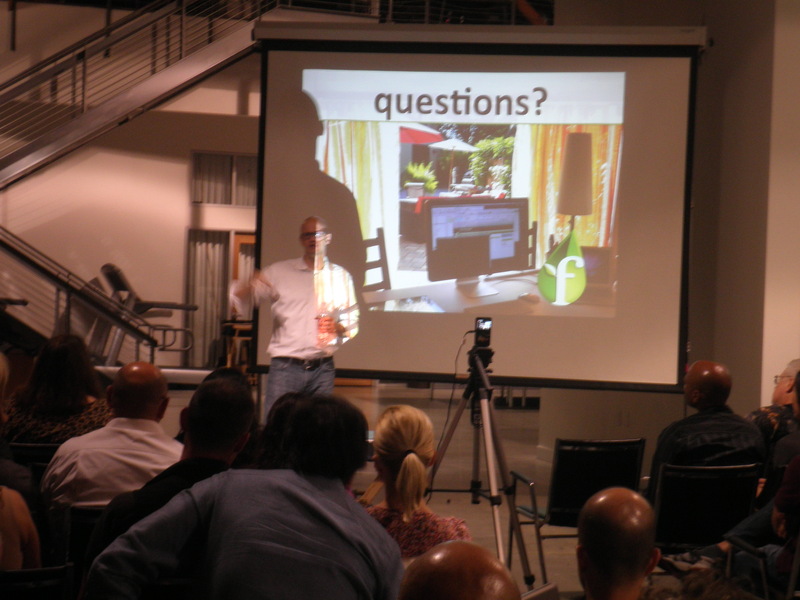 Next month’s event will be on June 19, 2013 with Gary Swart, CEO of oDesk. So our birthday is coming up. It’s been a whole year of pitches, demos, great talks and networking. 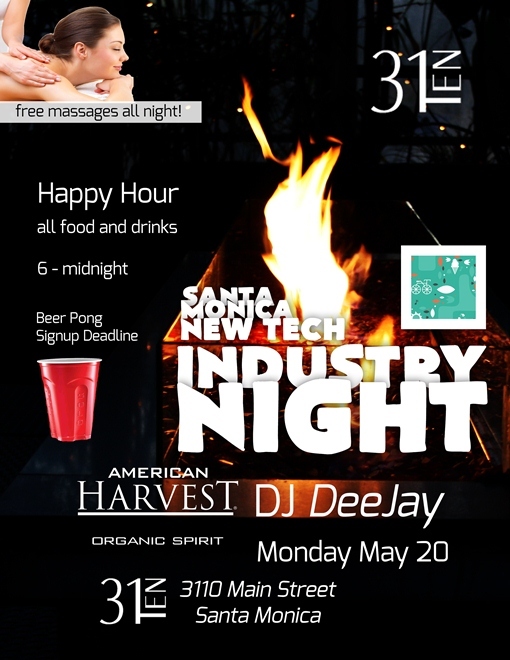 We will be celebrating our one year anniversary at 31Ten Lounge in Santa Monica 6:30PM -11PM on May 20, 2013. Our venue 31Ten Lounge provides free massages and happy hour prices. 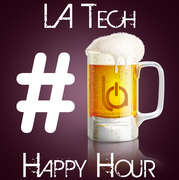 Our friends from La Tech Happy Hour will come and celebrate with us! Bring more friends, RSVP http://bit.ly/105QVmY. Submit feedback on SMNT in person or via SurveyMonkey anonymously http://svy.mk/19An8XQ, and get quoted! We will have cake, provided by our sponsor Elance. Elance is where people Work Differently™. A pioneer in today’s freelance revolution, Elance is the world’s leading platform for online work. Today over 500,000 businesses and 2 million freelancers use Elance in 170+ countries. Over 1 million freelance jobs are completed. Party on! Founder Institute Session LA: Developing a vision for your Startup Idea took place at Mahalo Culver City Office on May 15, 2013. Adeo Ressi, the founder of FI, was speaking about their program for entrepreneurs right before the application process for LA starts on May 19, 2013. About 50-70 people gathered to learn more about the program, that is available in 24 countries and 40 cities. It is a 3 months program that costs about $1000. “The Founder Institute is the World’s Largest Startup Accelerator, with a mission to “Globalize Silicon Valley” and help founders build enduring technology companies. Through our part-time entrepreneur training program, you can launch a company with guidance and feedback from experienced startup CEOs – while not being required to quit your job”. Adeo Ressi introduced his framework. What is your idea? Can your idea Change 1 mil lives? Can you employ 500 people? Can you run it over 20 years? Validation. Be ready to think about ways to kill your idea if not validated. 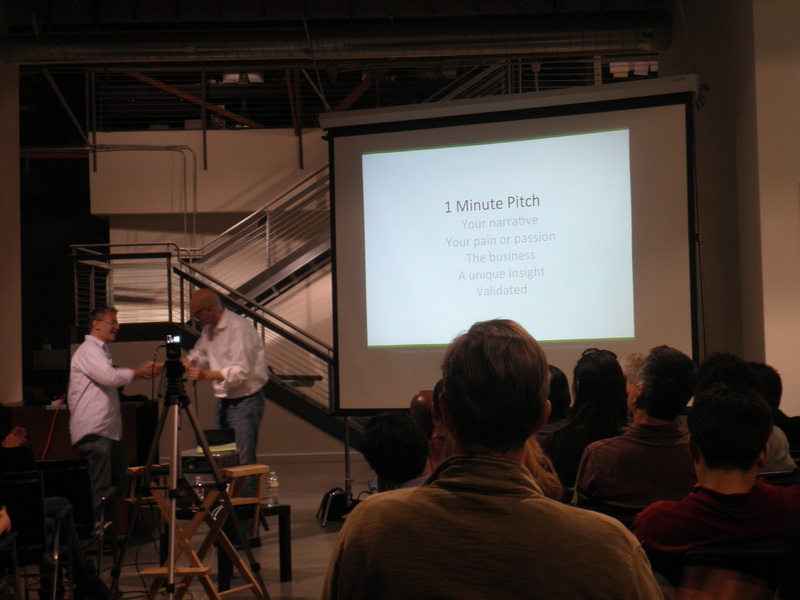 So pitch in 1 min: your narrative, your pain or passion, the business, a unique insight and validation. Several people from the audience got up and pitched: online database animal shelters, hackers hacking at resorts worldwide and some other ideas. The LA 3 months Program is Jun 03, ’13 – Sep 09, ’13.